Ah, looks like it might be a full house tonight. Maybe it’s the intrigue surrounding the play. and all that. One of his supposed ‘missing’ plays. original? Oh, I see. Mn. believe he never wrote any of those plays. foot there? I have my doubts. your eyes. That hairline. And the beard. Wait! Do you believe that? Would be a shame for both of them if it were true. I don’t think so. Then I’m from Warwickshire. Love the ghost story idea. I don’t know whether I believe that or not to be honest. Marlowe’s death is rather suspect and there are many holes in Shakespeare’s life but it’s very complex. Even if Marlowe had written all of Shakespeare, then Shakespeare is still ‘Shakespeare’! Chortling in my frontrow seat, am I! Ha ha, wonderful, especially when I read the notes at the bottom which added some fun to this very well constructed piece. The best part of history is always the mystery! Love this conversation, feel as though I’m a ghost myself eavesdropping from the seat behind…if we were to solve the mystery…the conversation wouldn’t have been as nearly compelling! Bravo! This is hilarious, the kind of conversation overheard in theatre bars. I don’t really care who wrote them, so long as I can revel in the language. Does that make me one of your philistines? Maybe there will forever be a touch of mystery to this. It only adds to Shakespeare’s luster. there is a lot that has happned in past and it is not to you to choose and interpret what suits your palate or sensibility and feed to your kids…. Thank you again Soma! I agree totally. Thank you very much Viv. Well, I don’t believe that Marlowe was the real Shakespeare – for one thing he died too young, and his work, such as it is – while funny, great, inspired – well, is not Shakespeare! That said, I really enjoyed your poem! I had not heard of this play at all. Very cool, and a very cool conceit here. Hi! Thanks very much for your comments. Although I’m not saying that Marlowe was the actual author of Shakespeare, there are some very interesting arguments going around currently. 1. The circumstances of Marlowe’s death, when you look at them, are very odd indeed. The inquest into his death was not discovered until 1925 and everyone involved in his death were the who’s who of Elizabethan intelligence! Strange, especially as it was very handy for him to disappear at such at time 1593, as he was being investigated for, among other things, being an atheist. 2. I take your point about Marlowe’s work not being like Shakespeare – this is certainly true if you compare, say, Marlowe’s Edward II with King Lear. However, if you compare say, Faustus with Titus Andronicus, which is a later Marlowe play with the earliest known Shakespeare, there is much more similarity in style. In fact, there have been studies (not publicised too much) which show that Marlowe’s style and Shakespeare’s are virtually identical. Henry VI parts 1, 2, 3 were all thought at one time to have been written by Marlowe, so similar were they in style. 3. The first known Shakespeare work, the poem Venus and Adonis, was first published anonymously a few weeks before Marlowe’s death. 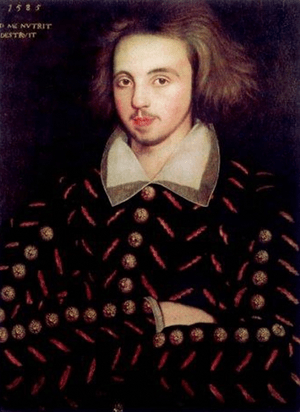 It was then republished two weeks after Marlowe’s death under the name of Shake-speare (hypenated!). 4. The sonnets, normally attributed to Shakespeare, tell a story of someone who is extremely emotional, anguished, and apparently in exile for some time. Yet we know very little of Shakespeare’s life. What little is known is that he was from Stratford, and was very litigious and materialistic, but someone to do with London also, and the playhouses. If however, as some conjecture, Marlowe did survive and faked his death (as some think), then the story of the sonnets would fit him hand in glove. Sorry to go on! I could’ve got a lot further but I just wanted to illustrate to you some of the argument I have been reading about. Whilst I am not saying that Marlowe wrote Shakespeare, I am remaining open minded to that possibility. After all, we do know that our most recent history in many cases has turned out to be lies, so why shouldn’t some of the more distant history also be fiction? And that is why history is so fascinating … beyond or below or above the ‘facts’ …thinking of real people … as flawed as any we know … but especially those who created wonderful things out of being flawed … with genius mixed in … Love what you created here out of your experience … connecting the present to the past, as it always is connected. Especially in its mysteries. interesting post , David. There have been more questions indeed if Shakespeare really wrote his own work or if he was a copy cat. We will never know for sure of course but after reading up on the facts of Romeo and Juliette not that long ago and if I add your findings to it , I do believe that it might be very well true that he did not write his own work. .